There is much to love in this book. 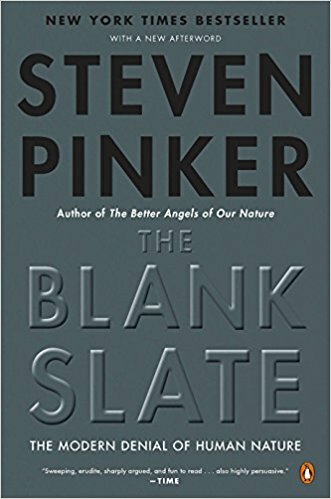 Pinker helps us understand the state of our current scientific knowledge about human nature, and suggests that our politics should be reevaluated based upon that knowledge. …Traditional political alignments ought to change as we learn more about human beings. The ideologies of the left and the right took shape before Darwin, before Mendel, before anyone knew what a gene or a neuron or a hormone was. Every student of political science is taught that political ideologies are based on theories of human nature. Why must they be based on theories that are three hundred years out of date? In his main chapter about politics, he points out that liberals and conservatives each have combinations of views that, on their face, do not seem to be necessarily connected. For example, why should identity politics and civil libertarianism (typically) go together? Why should religious fundamentalism and free-market technocracy go together? Pinker draws our attention to a particularly good account of the “underlying dimension” (offered by Thomas Sowell), and refers to the two visions of the nature of human beings as the Tragic Vision and the Utopian Vision. In the Utopian Vision, psychological limitations are artifacts that come from our social arrangements, and we should not allow them to restrict our gaze from what is possible in a better world. Its creed might be “Some people see things as they are and ask ‘why?’; I dream things that never were and ask ‘why not?’” … The Utopian Vision is also associated with Rousseau, Godwin, Condorcet, Thomas Paine, the jurist Earl Warren, the economist John Kenneth Galbraith, and to a lesser extent the political philosopher Ronald Dworkin. A potential application of this notion would be to the dispiriting views of political scientists like Achen and Bartels, who lament that voters uncritically accept arbitrary combinations of issue positions promoted by the party with which they’ve identified. Maybe the combinations aren’t completely arbitrary! The obvious cure for the tragic shortcomings of human intuition in a high-tech world is education. And this offers priorities for educational policy: to provide students with the cognitive tools that are most important for grasping the modern world and that are most unlike the cognitive tools they are born with. The perilous fallacies we have seen in this chapter, for example, would give high priority to economics, evolutionary biology, and probability and statistics in any high school or college curriculum. Unfortunately, most curricula have barely changed since medieval times, and are barely changeable, because no one wants to be the philistine who seems to be saying that it is unimportant to learn a foreign language, or English literature, or trigonometry, or the classics. But no matter how valuable a subject may be, there are only twenty-four hours in a day, and a decision to teach one subject is also a decision not to teach another one. The question is not whether trigonometry is important, but whether it is more important than statistics; not whether an educated person should know the classics, but whether it is more important for an educated person to know the classics than to know elementary economics. In a world whose complexities are constantly challenging our intuitions, these tradeoffs cannot responsibly be avoided. …Even if inherited talents can lead to socioeconomic success, it doesn’t mean that the success is deserved in a moral sense. …Can one really reconcile biological differences with a concept of social justice? Absolutely. In his famous theory of justice, the philosopher John Rawls asks us to imagine a social contract drawn up by self-interested agents negotiating under a veil of ignorance, unaware of the talents or status they will inherit at birth— ghosts ignorant of the machines they will haunt. He argues that a just society is one that these disembodied souls would agree to be born into, knowing that they might be dealt a lousy social or genetic hand. If you agree that this is a reasonable conception of justice, and that the agents would insist on a broad social safety net and redistributive taxation (short of eliminating incentives that make everyone better off), then you can justify compensatory social policies even if you think differences in social status are 100 percent genetic. The policies would be, quite literally, a matter of justice, not a consequence of the indistinguishability of individuals. Indeed, the existence of innate differences in ability makes Rawls’s conception of social justice especially acute and eternally relevant. If we were blank slates, and if a society ever did eliminate discrimination, the poorest could be said to deserve their station because they must have chosen to do less with their standard-issue talents. But if people differ in talents, people might find themselves in poverty in a nonprejudiced society even if they applied themselves to the fullest. That is an injustice that, a Rawlsian would argue, ought to be rectified, and it would be overlooked if we didn’t recognize that people differ in their abilities. [Robert] Wright argues that three features of human nature led to a steady expansion of the circle of human cooperators. One is the cognitive wherewithal to figure out how the world works. This yields know-how worth sharing and an ability to spread goods and information over larger territories, both of which expand opportunities for gains in trade. A second is language, which allows technology to be shared, bargains to be struck, and agreements to be enforced. A third is an emotional repertoire— sympathy, trust, guilt, anger, self-esteem— that impels us to seek new cooperators, maintain relationships with them, and safeguard the relationships against possible exploitation. Long ago these endowments put our species on a moral escalator. Our mental circle of respect-worthy persons expanded in tandem with our physical circle of allies and trading partners. As technology accumulates and people in more parts of the planet become interdependent, the hatred between them tends to decrease, for the simple reason that you can’t kill someone and trade with him too. I am particularly interested in the possibility that, if there is more widespread knowledge of how the world works among the general population, on balance it will tend to expand the circle of cooperation and political will. And, returning to Pinker’s challenge, quoted at the beginning of this review, I am also hopeful that we’ll update our 18th-century thinking about democracy and education. During the Enlightenment and at the founding of the US, an understanding of government and economics was only accessible to a handful of affluent men, and the only learning technologies were relatively-scarce printed books. The founders could never have imagined our current century’s resources. ← Do We Even Need a Solution? 1 Pings/Trackbacks for "Old and New Thinking about Politics and Human Nature"